A game of bluffing and deceit. You are a noble of the court, and the monarchy is unstable. Now is a ripe time for a coup to seize the throne. However, you'll first need to take down your rivals who may have the same idea. The nobles all have influences over various important characters of the court, whom they may use to do their bidding. It will take wit and guile to prevail as seize power for yourself. 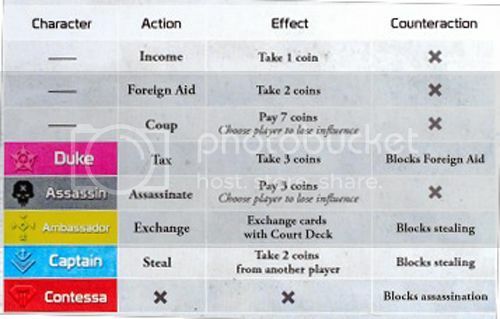 Each player starts with 2 characters under their influence (known only to themselves), and 2 coins. Players can perform 1 action per turn. Everyone has the same 3 basic actions, but each character also has a special action of their own you can use instead. The catch is you can attempt to use the actions of characters you do not actually control. If nobody calls your bluff, the action proceeds. If somebody calls you a liar, you must prove you hold the character under your control. If you do not, you lose one of your characters. If you do, then the accuser loses one of their characters, and you will be given a new character to replace your revealed one. Players will have 24 hours to take their turns, or I'll default them to the first basic action. Once everyone has specified their action, I will allow 24 hours for people to choose whether they want to accuse anyone of bluffing (if applicable). Additionally, if all players specify that they won't accuse anyone, the game can proceed before that second 24 hours is up. Between turns I'll assign any replacement characters, list everyone's total coins, etc. The winner is the last person with any characters under their control. Once you lose both of your characters, you're eliminated from the game. This is meant to be played with cards, and there's a specific amount. There are 15 cards, 3 of each character. The maximum players is 6. Thus, there will be 3 cards leftover which will be the pool used to determine what new character a person gets if they are forced to reveal one of theirs after being accused. Their revealed card goes into the pile and they get a new one from it at random. Characters that are "lost" in other ways (penalty for an incorrect accusation, assassin target etc) remain face-up; thus it gets harder to bluff as cards are revealed as the game progresses. I'll be PMing everyone their 2 characters, and keeping track of the leftover 3. Any revealed characters will be listed in this first post along with the other player info such as amount of coins. Also, you CANNOT change your action once you say it. Turns are meant to be taken in a set order, but I feel for the sake of expediency I'll let everyone take their turn whenever. I don't think it'll really impact gameplay, and this is meant to be a really brief game because there's not a lot of depth, so I think that change is for the best. 6 Players maximum, 2 minimum. Okay I'll start this tomorrow sometime. We can play with 3 people. Of course, it'll still be open for anyone else until we actually start. I'm handing everyone their 'cards' via PM now. As soon as you've got them you can take your action for this turn. Once everyone has taken their turn, cast any accusations about anyone you think is bluffing. EDIT: Also remember you all start with 2 coins already. Gonna use Tax. You can never have too much money! Since we have 2 charas- are we supposed to take 2 turns? Or- does only one of our charas play per turn? Only one action per turn, I believe. The two characters are to give you more options. Cool- I'll use foreign aid then. I assume Trinity- since you've used your turn already, you can't counteract this? I'm not sure how Counteractions work, actually. Are they active or passive, Daysie? Counteractions can be used if someone targets you with an action you can counter. And yeah, once you post your turn your turn is done. You can't change your action. The only further action you can take is to activate a counteraction if possible. I shall activate my counteraction to prevent Drawfag from stealing from me then. Can I activate two Counteractions in a turn? So how exactly does foreign aid work? Cuz it says duke blocks foreign aid but it's not really ... DIRECTED towards them right? I guess actually I explained it wrong. It doesn't have to be an action targeted at you. In fact, even with ones like Stealing and Assassination, you could block them even if someone else is the target if you wanted. So really it should've said "counteractions can be used whenever an action is taken that you can counter"
ah- makes more sense. COOL. I will Assassinate Limerence this turn. BAM. Trinity's lied at least once this game already. But I've got a feeling that her Assassin card is legit. Not calling it.